Farmgate prices remained reasonably steady in March compared with February, while average retail prices rose slightly. Since this time last year, both farmgate prices and retail prices have declined slightly, although farmgate prices have fallen more sharply. Looking at individual cuts, boneless shoulder recorded the largest month-on-month increase, up 4% according to the AHDB price survey. Loin steaks and loin chops both increased by 2% month-on-month. 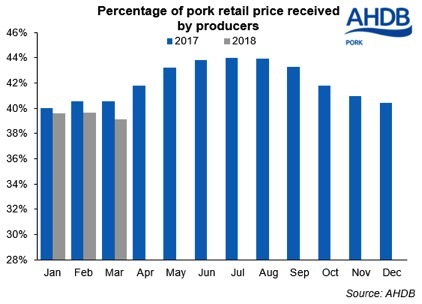 While fillet of pork declined by 2% on-the-month, the other cuts remained steadier month-on-month. Compared to a year earlier, the price performance was more mixed. Traditional pork sausages are up by 14%, while loin steaks down by 3%.